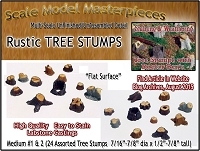 Want to know the easiest & fastest way to realistically stain & weather stumps? We have the *Tips & Techniques* article for you in our Blog! All of the castings include the shown quality detail (not too much) and all that is left is to stain and install!. Really, you don't know a really easy and fast way to stain Resin, Hydrocal & LabStone castings? Just Ask Doctor Ben! 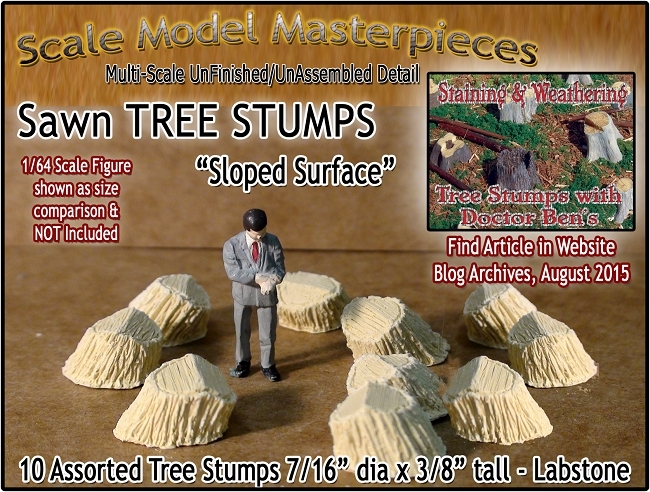 NOTE: SMM LabStone castings are of a pale yellow/tan color. The weathering and staining shown in the image is to illustrate the quality detail of this item. Farmer Produce/Orchard Smudge Pots (6pcs) N/Nn3/1:160 California Freight & Details Co.